A friend and fellow UCLA alumni shared about the Facebook Group "Vintage Los Angeles". If you're on Facebook, I'd recommend taking a peek at some of the photos at "Vintage Los Angeles." An amazing early color shot of Hollywood. No idea what year this was taken. Judging by the cars, maybe mid 1920's? 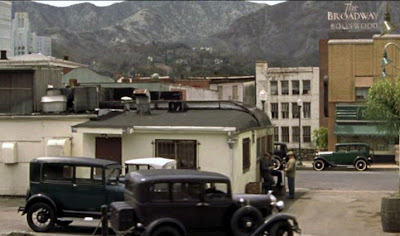 Someone commented "is this real life 1920's - or a movie set designed to look like it?" This being Los Angeles, I guess it could be either one. I love how the color photo makes the whole scene look so, well, real. 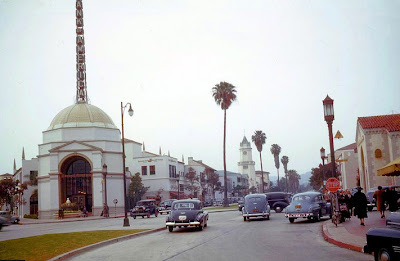 Westwood Village 1941. Many of the historic buildings in the the Village are still there. 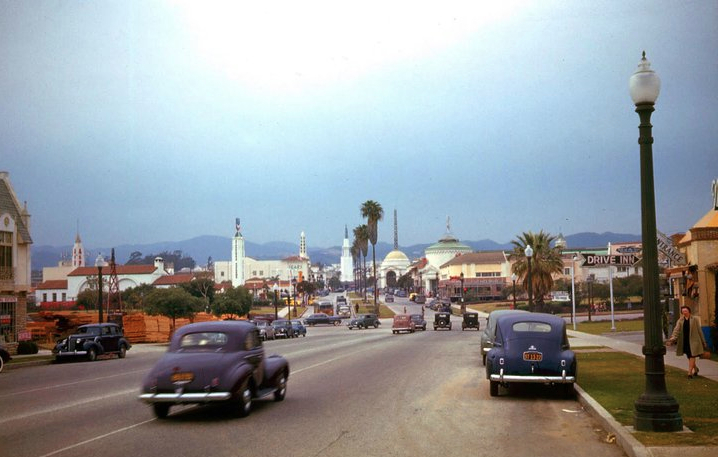 Another shot of Westwood, 1941. Stop signs vs. stop lights with a Bank of America branch in the distinctive domed building at the corner of Westwood Blvd and Kinross. Westwood Village, 1950's. It certainly was more "filled in" with stop lights and Ralphs grocery store on the corner of Westwood Blvd and Lindbrook. 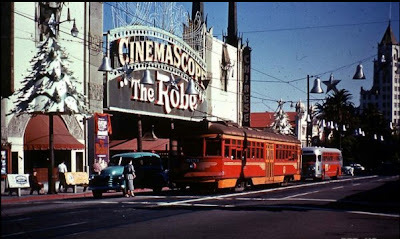 Grauman's Chinese Theater, 1953 (I cheated and looked up what year "The Robe" was in theaters). Love the Pacific Electric Streetcar rolling down Hollywood Blvd. Looks like something out of "Who Framed Roger Rabbit?" - except that this was the real deal. The Brown Derby restaurant, 1954. 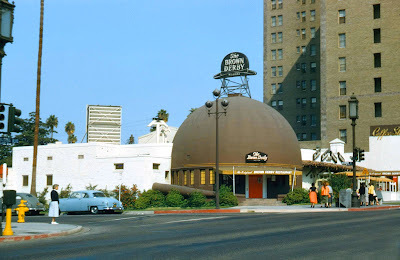 There were actually four Brown Derby restaurants in Los Angeles: Wilshire Blvd (pictured above, located across the street from the Ambassador Hotel), Hollywood, Beverly Hills, and Los Feliz. 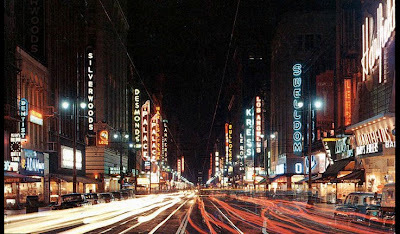 Broadway Avenue, downtown Los Angeles, 1959. Before WWII, Broadway was the commercial and entertainment center in Los Angeles. Here's a link to what Broadway looks like today. 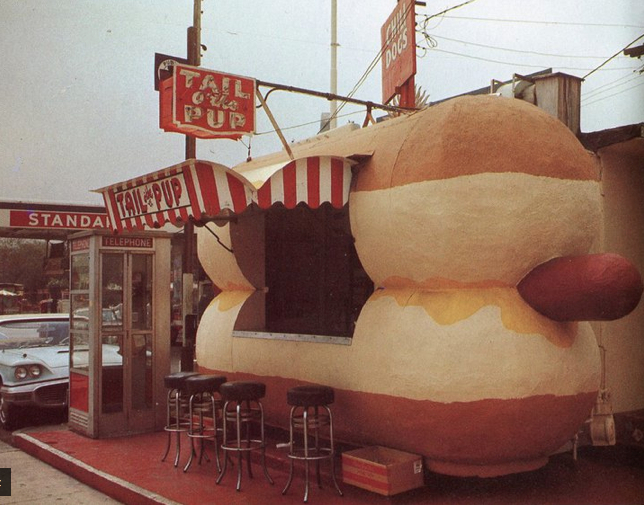 "Tail of the Pup" hotdog stand. date unknown. Built in 1946, it's one of best examples of mimetic architecture in Los Angeles. The stand was closed in 2005 and is looking for a suitable place to re-locate, possibly West Hollywood. In the early 1960's, Third Street in Santa Monica was just that: a street. 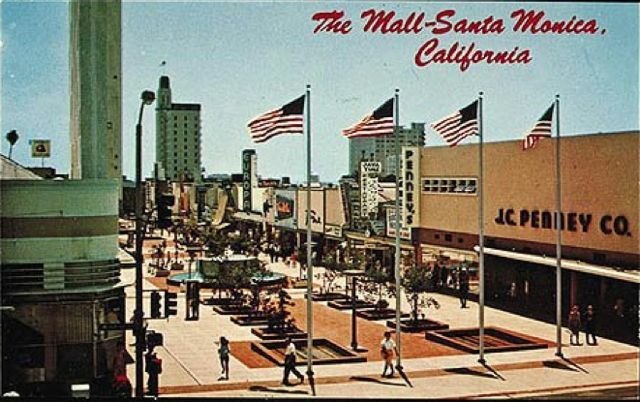 In 1965, the city closed Third Street to create the early and original "Santa Monica Mall." 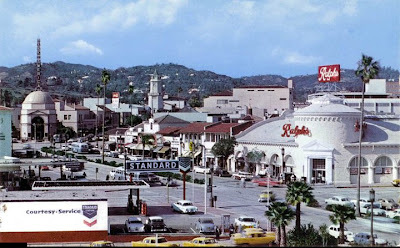 Here's a photo of the original outdoor mall, looking south east from the corner of Wilshire Blvd. 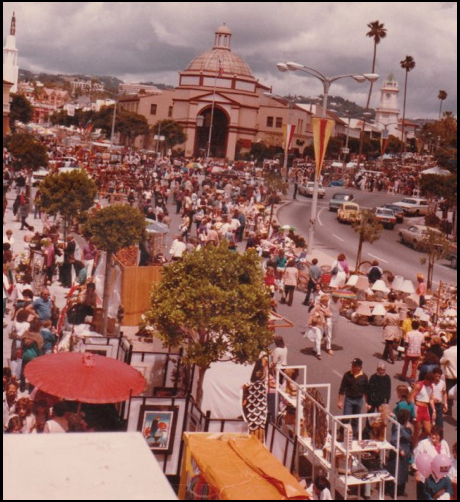 By the mid-1970's the mall had fallen on hard times, and in 1989 was transformed into the hugely successful "Third Street Promenade." Not everything "back in the day" was necessarily good. One thing that was definitely NOT better in the past was air quality. Smog in the 1960's and early 1970's was absolutely TERRIBLE, as this photo from 1964 attests. Ironically, while traffic has gotten much worse, the air quality (thanks to the efforts of the AQMD) has gotten much better. A final shot of Westwood Village, 1980. I'm old enough to remember the Westwood Village Art Shows - does that make me "vintage"? Maybe. I actually have a painting hanging in my home that my parents bought at one of these art shows. I'm curious what Los Angeles will look like 50-80 years from now. 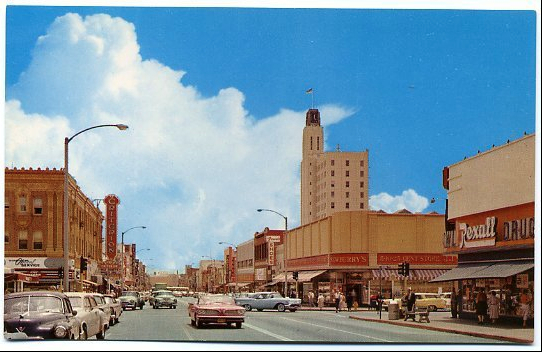 More photos can be found on the Facebook group "Vintage Los Angeles." That first photo of Hollywood is amazing. Great stuff! 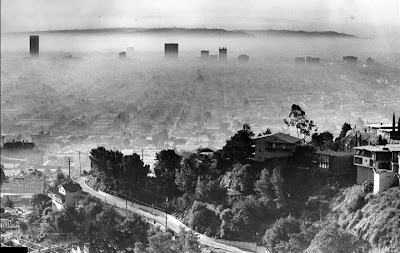 I grew up outside of LA in the 60's and the wall of smog would reach us (Riverside/San Bernadino) every after noon. Hated it. But I think the air is better not due to local air quality efforts, but better technology in car emission systems. This was mandated by the feds and the car comopanies screamed about it back then. But it worked...sort of. The air is still bad during the summer. Hi there!! I run Vintage Los Angeles and can't thank you enough for all the support!! THANK YOU!! Feel free to post your blogs on VLA anytime! FYI... that first shot is not vintage, but rather a heavily CGI'ed frame from the [awful] Kate Winselt "Mildred Pierce" remake of a few years ago. "If You See Honey ..."